"The foundation's mission lines up very well with my personal goals of becoming a university research professor," Argueta said. "The financial support enables me to take my time in planning the next steps in my career." The one-year fellowship will allow Argueta unfettered time to complete his doctoral degree while also seeking out a postdoctoral position. During this time he will continue to be mentored by his guidance committee: Nicholas V. DiPatrizio, an associate professor of biomedical sciences and Argueta's doctoral dissertation advisor; Victor G. J. Rodgers, the Jacques S. Yeager, Sr. Professor of Bioengineering; and Christian Y. Lytle, an associate professor of biomedical sciences. "Donovan embodies the true spirit of the Ford Foundation Fellowship Program's mission to increase diversity among the nation's university faculty," DiPatrizio said. "He is a first-generation U.S. citizen and the first in his family to not only pursue a doctoral degree, but to earn a bachelor's degree. This speaks volumes to Donovan's unique ability to overcome any perceived challenge presented to him. I have no doubt he will become an outstanding research faculty serving as a role model for underrepresented individuals in scientific research." DiPatrizio added that Argueta's dissertation is centered around an important project aimed at identifying key biological mechanisms in the gut that become dysregulated in obesity and drive overeating of high-energy foods. During the fellowship period, Argueta will focus on biochemical and molecular signals in the gut that drive increased eating behaviors in obesity as well as the consequences of these signals. "Obesity is an epidemic, and in the Riverside area individuals are affected at higher rates than the national average," Argueta said. "Minority groups are even more susceptible to obesity — especially in childhood. In addition to the physical and mental health disparities associated with obesity, this epidemic places an enormous financial burden on our health care system. My research aims to provide background and understanding into the onset and persistence of overeating as a way to inform treatment and prevention of obesity." "Donovan's research findings will aid in the development of novel therapeutics designed to target the endocannabinoid system in the gut for the safe treatment of obesity and related metabolic diseases," DiPatrizio said. 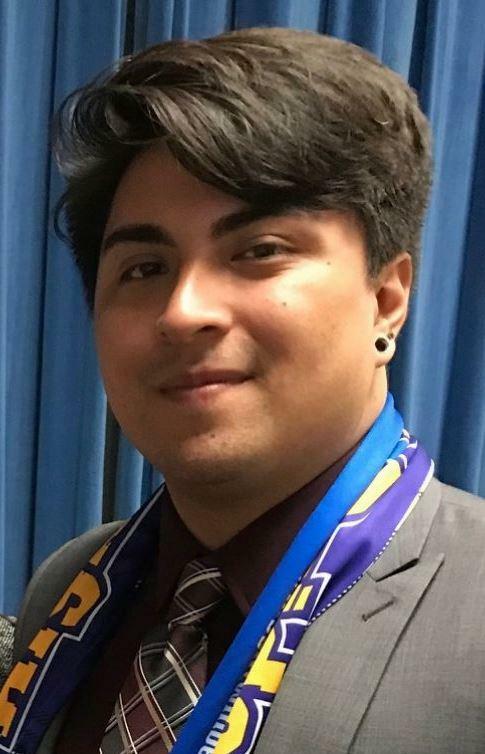 "It was his passion for the mission and research being done at UCR that convinced me to apply for graduate studies here," Argueta said. "My interest in bioengineering germinated when I saw the film 'Jurassic Park' at a young age. It sparked my curiosity into science and the incredible power of biology." "I owe my research progress and support in applying for a Ford Foundation Fellowship to my dissertation committee as well as the departments of Bioengineering and Biomedical Sciences," Argueta said. "The help and encouragement I received from them have been invaluable."